In the last few months, I’ve managed to connect to some really awesome indie authors. They are doing some great stuff, and I’ve been encouraged and inspired. I’ve taken the chance to sign up to some great online and blog events. Of course, October is a great month for those who write about ‘things that go bump in the night’ in all their flavours. This means that there are a gazillion blog posts, articles, giveaways, book reviews and articles sloshing around the web. I’ll be taking the opportunity to share some of these. It also means that I have committed to far too many things – but that is par for the course! I will be posting most days. Not only will I be linking to other authors during October, but I’ve committed to posting quite a few bits from me. So, if you like a supernatural flavour, keep an eye out! 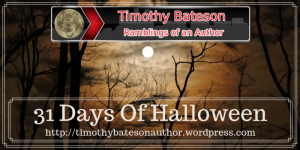 Today I’m sharing the link to Timothy Bateson’s blog, and the post which kicks off his amazing ’31 Days of Halloween’. In case you don’t notice, I’m on 24th, but, to be honest, I’m really looking forward to reading all the great stuff that’s scheduled. Also coming up is October Frights which is an intensive five days of all things Horror and Paranormal. I will be posting and sharing a lot so brace yourself for loads of links and some original fiction from me. In other news, I’m still working on the newsletter. I have the content, but I’m getting bewildered by the legals. The first edition will go out as soon as I can manage. The link to subscribe is here, if you are interested. And for anyone who missed it, here is the latest instalment from the White Hart. Happy reading! Lyssa, it’s my pleasure to run this event every year, precisely because of the variety of material that comes up.